The Canine Country Getaway location is an extended part of Glen Highland Farm acreage set aside for people who like to vacation with their dogs. The land was once home to the Iroquois Indians who lived near the beautiful Butternut Creek, a huge curvy stream filled with trout, abundant wildlife, endangered butterflies and birds. The Creek winds through 175 acres of rolling meadows and winding trails and our 2-acre spring-fed pond, all perfect surroundings for you to enjoy a great vacation at the same time your dog enjoys an outdoor adventure. We have 2 small cabins nestled high up on the Ridge, secluded amidst tall pine trees with a scenic vista below. Each cabin is furnished with two comfy cots, storage shelves, lanterns, rugs, chairs and a heater (for cooler weather). Each cabin provides plenty of room for two people plus their dog or one person with multiple dogs or for anyone who wants to enjoy the cabin fully for themselves and their canine companion(s). The solitude and fresh air will easily make sleeping a joy for you and your dog! Guests will need to bring their own pillows, bed linens or sleeping bags and blankets. See Guest Info for what to bring. Situated below the Ridge, are 2 spacious large cottages, each with two “large-man” cots, dressers, lanterns, rugs and chairs. The peaceful setting gives you plenty of privacy and also quick access to nearby trails. The views from the windows are gorgeous! The large cabins easily sleep two to four people with their dogs. They are perfect for friends vacationing together or for a couple who want lots of space to unwind. Guests will need to bring their own pillows, bed linens or sleeping bags and blankets. The Farm RVs are a real home away from home and wonderfully situated at the foot of a 30-acre meadow. With 5 standard RVs or 1 deluxe RV to choose from, visitors opt for RVs for access to full electricity complete with heating or air conditioning. RVs all have a separate bedroom (with full, queen or king accommodations), the convenience of a private bathroom, lots of storage cabinets, an eat-in kitchen equipped with stove, refrigerator and freezer, microwave and coffee maker. Kitchens are stocked with basic cookware, glasses, mugs, dishware and utensils. If you feel like cooking out, feel free to use the gas or wood burning grills and prep space in the outdoor dining pavilion. Living areas have a comfy sofa (dog approved!) with throw blankets and pillows and also VCR/DVD and stereo. While RVs have their own bathroom with toilet, sink and shower, many guests opt to use our separate full size bathroom and shower facilities. You will need to bring your own bed linens, pillows and blankets. 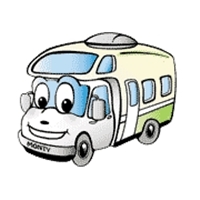 Have your own RV or RV rental? Load up the dogs and come on over! We have RV hookup sites for you to rent. This entry was posted in New York RV Camping Vacation, Pet Friendly Vacation and tagged New York RV Camping, NY RV Vacation, Pet Friendly Vacation. Bookmark the permalink.